Get every 3rd night free AND kids sale free with this incredible offer! For a VERY limited time, you can get an incredible deal on a Royal Caribbean cruise! 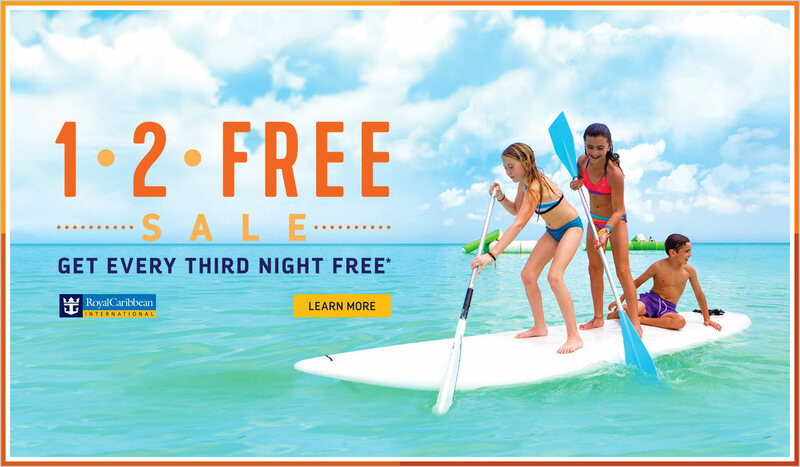 With Royal Caribbean's 1-2-FREE deal, you get every 3rd night free & kids sail free!! And if you choose to sail on Anthem of the Seas, Royal Caribbean's most revolutionary ship, you can ALSO get a FREE upgrade from an Ocean View to a Balcony cabin. Cruise must be booked by January 4, 2017. Offer applies to cruises that depart on or after January 1, 2017. 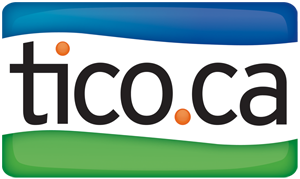 For information or a free, no-obligation quote, click "Get Prices & Dates". This is not a cruise. This is your chance to break from the cold and escape to the bold — with big savings on the ultimate adventure. Go off-roading in Oranjestad, Aruba, and trek through Tortola for a dip in the Virgin Gorda Baths. Explore unforgettable shores onboard ships that are one-of-a-kind destinations all their own. 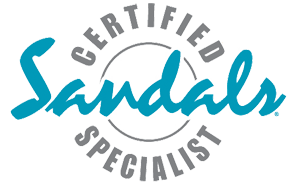 All on the cruise line voted Best Overall 13 years running. This is not the Caribbean. This is the Royal Caribbean®. Cruise must be booked 12/1/16-1/4/17. Offer applies to cruises that depart on or after 1/01/17. Offer excludes China departures. Free sail nights based on sailing length and applied in the form of a discount towards the total stateroom cruise fare. Additionally, offer provides for free cruise fare of third and higher guests who are 12 years or younger as of cruise departure date, booked in the same stateroom as the first two Offer qualifying guests in a triple or quad occupancy stateroom on a 5 nights or longer sailing that depart between Jan 5, 2017-May 15, 2017 or Sep. 5, 2017-Nov. 15, 2017. Kids Sail Free Offer excludes China and Alaska cruises and sailings departing on or between 2/16/17-2/23/17, 3/10/17-3/20/17, 4/6/17-4/16/17 and Harmony of the Seas. Also, offer provides for free upgrade from Ocean view to balcony on Anthem of the Seas sailings departing on or after Jan 1, 2017. Free upgrade refers to booking a balcony stateroom for an ocean view stateroom at standard/full fare. All other charges, including but not limited to taxes, fees and port expenses, are additional and apply to all guests. 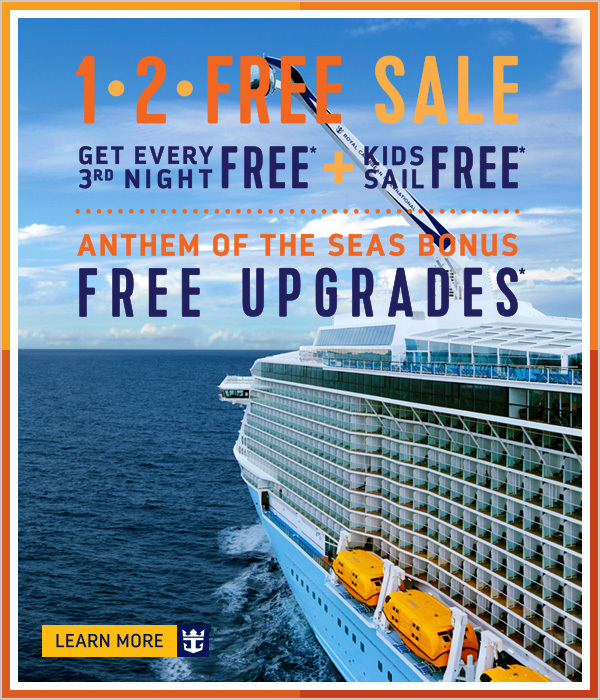 1-2-Free Offer is combinable with Kids Sail Free, Anthem Upgrades, Crown & Anchor Balcony & Suite Discount, Next Cruise offers, and Shareholders benefits. Not combinable with any other offer, restricted rate, or promotion. Offer open to residents of the U.S. and Canada. Prices and Offer apply to new, individual and named group bookings confirmed at prevailing rates; are subject to availability and may change without notice; are capacity controlled; and may be withdrawn at any time.